Dummycell™ - Allied Plating Supplies, Inc. 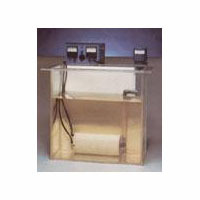 The Dummycell™ will keep your bath to less than 2 ppm copper and you do nothing! Forget about after-hours maintenance, parts lost to poor maintenance, expensive additives that are just a band-aid. Give your main rectifier a break. 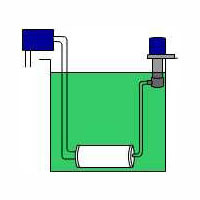 The Dummycell™ is a system comprising a small pump, a power supply and a collection canister which actually sits at the bottom of your nickel tank. It employs an expanded surface area cathode which translates into a very low current density. This insures the ability to dummy out any low level copper contaminants without taking out the nickel as well. 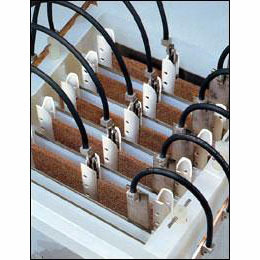 In various tests performed at actual beta sights, The Dummycell™ was able to keep copper concentrations to less than a part per million in up to an 1100 gallon watts nickel bath. Normal setup is as pictured above, however, vertical mounting is also possible.